Discover Bali from underwater experience which bring you to another paradise. Marvel at the wide variety of tropical fish and live coral flora and fauna. Enjoy your private pick up by professional driver and lunch at local restaurant. Pick up from your South Bali hotel at 9am, your driver will take you to Nusa Dua. Prepare your diving activity with listen to a simple informational briefing about the activity from your guide, no previous experience is necessary, and there's no need to learn how to use any special equipment. Nusa Dua have a beautiful barrier reef which is extremely accessible to visitors due to its nearby location and shallow depths. The warm, tranquil waters play host to an abundance of plant and marine life. This site is perfect for all divers and snorkelers with depths ranging from 2-16 meters (6-50 feet) and visibility around 10-25 meters (33-82 feet). 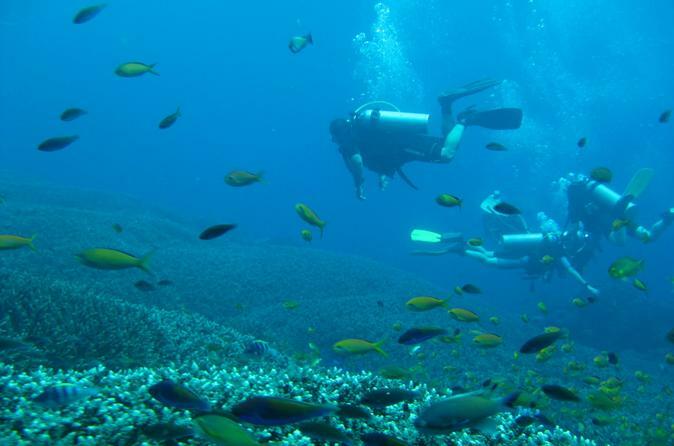 Explore Bali from underwater and meet with beautiful marine animals. There's many kinds of fish, marvelous and colorful coral reefs, turtle, and you will be amazed with the view. Then, you can enjoy lunch at local restaurant with delicious Balinese dishes. Following by having a relaxing and tea time in coffee agrotourism. Here you can learn about coffee and spices growns by local farmers, see the making process, and taste some sample of beverages. Your tour is finished when the driver take you back to your hotel.